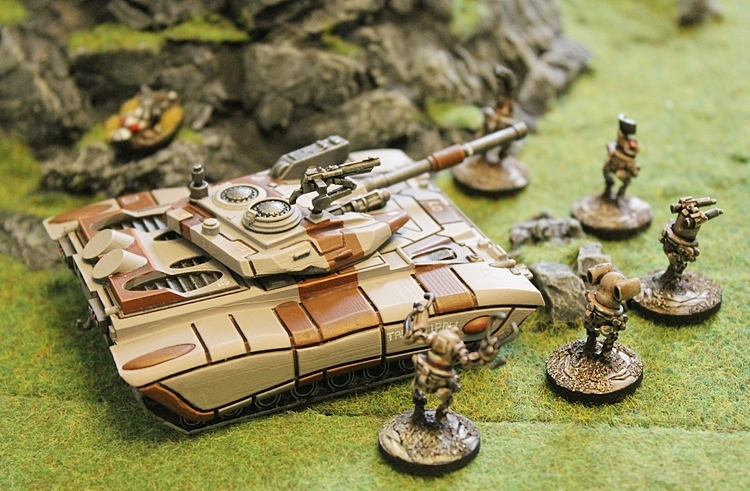 Wednesday 7th October 2015 sees the start of the pre-orders, the Early Supporter Offers on the Taranis Tracked Tanks. Five variants, each of them created by industry legend Bob Naismith, cast in resin and white metal. Each with a discount off the 20.00GBP release price, each with a free pack of Running Drones worth 5.00GBP automatically include. Every order shipped on the same day worldwide after the offer ends on 22nd October. Every order gets the free monthly miniature worth 0.60GBP which is IMP26 Female Nox Trooper and of course when you are an Ion Age customer you have an account and earn Reward Points which can then be used on future orders, discounts and promotions! 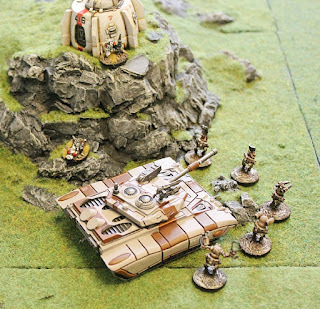 We really are one of the best brands to deal with for 15mm science fiction wargaming so you tell us across the globe. Go to the Early Supporter Page HERE during the offer period to get your tanks. 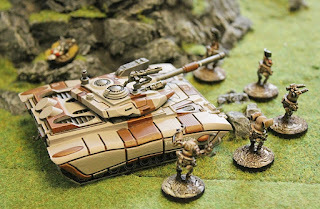 This is the last article on the Taranis Type 40 Tracked Main Battle Tank otherwise known as IAF100 in our code structure and this time we will be talking about the place of Taranis in the armies of the Prydian Precinct and we will be doing this using extracts from the future published sequel to Patrol Angis the book Callsign Taranis. There are other articles to peruse including one on the Taranis Drones, on the Tanks in Action and the contents of each IAF100 Kit click on each to go to them. Read on and enjoy. "The Taranis hull is a marvel of the teaming of technology and long achieved skill in warfare. Termed the MkII the standard hull for all Taranis models weighs in at standard count gravity 1.0 at around 67 tons of titanium alloy armour and internal systems along with the GroatVey MkX HeavyIon Reasc Fusion Reactor that provides the growl for the monster. Using the principle of ion particle beam collision to ignite fuel pellets the MkX reactor provides some 3000 horse power or about 3480Kw of usable electrical energy to the power train. This hull is then paired up with a motive system to produce a model based firstly on its propulsion and then on its particular use on the field of war. This specialisation through modular fabrication is the key to the success of this tank across more than eighty star systems. There are four motive systems which the Targa Works on New Glastonbury produce (there are also other works across the Precinct capable of this and jealously guarded) and these are the Model 40 Tracked, the Model 6 Wheeled, the Model 9 Lifter and the Model 32 Repulsar. The Type 40 Tracked features a wide based pair or treads made of Hackamold maxdure composite which is heat and pressure resistant and on good ground can reach nearly seventy miles per hour. 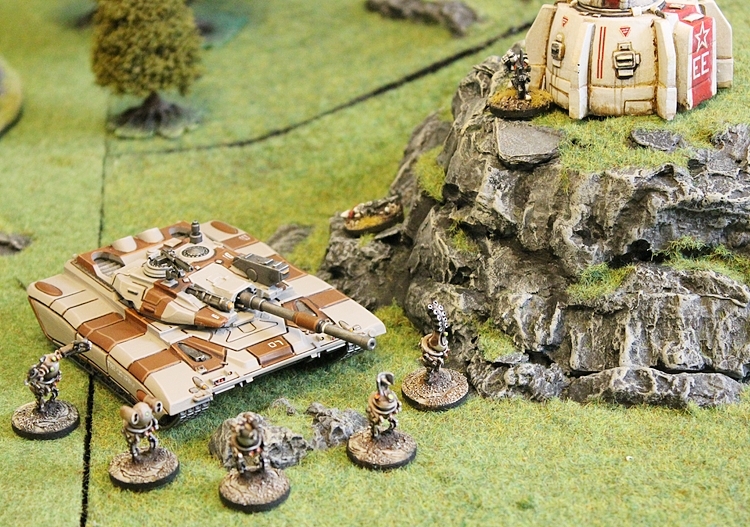 Taranis carry a crew of four trained operators who are drawn from the Fortress and Fleet arms of the Prydian Army. Retained Knights and Muster serve as crew but seldom mix and it is almost unknown to have Starvaulters in the seats of control. Using the Bragan Memetic Neural Linkage system the crew are mentally attached to the vehicle and control its system. This is a dry linkage as all wet implants were banned after the Gurtan Activation. There is a driver centrally located, a communications and drone controller who handles the screen of drones the tank has and its comms gear. The third crew member is the knight who operates the primary weapon systems and secondary linked weapons. Lastly the artificer who oversees the condition of the vehicle and all minor in combat functions often sharing the work of the secondary weapons and drones. The Taranis Type 40 Tracked main battle tanks have five core variants and fighting load weights of eighty to ninety one tons." "The Taranis Model 40 Tracked has five primary types and well as several secondary types and a few specialised adaptive local variants. The role of the types is battlefield dependant and all crews are trained to operate effectively the primary types and most of the secondary ones too. Here follows the distinctions of the primary types of the Model 40 through modular assembly of the hull. Taranis Type 40 Tracked Type A the is standard main battle tank which features a turret mounting a Bodkin AP 130mm Cannon which is the normal projectile main armament of the Taranis series this cannon has an effective range of seven miles and features several choices of munitions including the Phelot Ex22 AP for anti-vehicle use and the TX12 Imploder for infantry clearance as well as the Habkut Variacluster which is a middle class multi-target round. The Type A mounts a secondary weapon the Angis Mk9 22mm Automatic Rifle which can be manually operated from the crew turret hatches or controlled from within in the tank. Some fifty percent of Model 40's across the Precinct are Type A. Type B is the command variant of the Model 40 and is allocated at a rate of one to three or one to four of that of the Type A. With improved comms suite and space for an additional operator if required the Type B has a modified turret with better optics and range finders as well as a Moth 88 Rotary Cannon centrally mounted. Type B also has the Bodkin AP 130mm main gun and the Angis Mk9 too. For use on worlds with challenging terrain or low gravity where recoil is problematic the Type C of the Model 40 is deployed and this also features for extra-atmospheric use on asteroids and other space bases. With a turret crewed by a specially trained gunner the main gun of the Type C is the terrifying super heavy Fretan SBP9 Sequence Particle Beamer with the space removed from the main hull of the gunner being taken up with a small secondary GroatVey MkV HeavyIon Reasc Fusion Reactor slaved purely to the SBP9 and its massive energy requirements for sustained rates of fire. About five percent of all Model 40's are Type C and also Type D as well. The Type D is intended for close in warfare in urban and also warfare within starships if required and is the siege warfare type sporting a re-enforced turret with twin Ron MegaMax II 95mm Hi-Ex Launchers. The Ron weapon system has reduced range compared to the reach of the Bodkin 130mm but its destructive potential matches the hellish maelstrom of the SBP9. Hurwent shields and rubbacrete are not a match for the Ron which can reduce structures to rubble and also blast apart the heaviest titanium alloy hulls. Finally of the primary types is the Type E Model 40 Taranis Armoured Personnel Carrier. The Type E features a rear hatch and additional hull armour at the expense of a turret and two of the four crew normally in the tank. Instead a well furnished internal bay has space for a dozen or more fully equipped Retained Knights or near a platoon of Muster or other non-armoured infantry. The APC type has a top mounted Angis Mk9 22mm Automatic Rifle giving fire support to disembarking troops and is the favoured transport of most in free fire zones." "Auto-Trainer series 52 previous input explained the five primary types of the Model 40 Taranis Main Battle Tank and this now continues into the secondary types and local specialised adaptive local variants. This is not an exhaustive list as local variants are many and the Leagues have made many alterations to the Model 40 based on their particular needs. The Type F is gaining popularity and since 4326IC has been fabricated in great numbers for regiments on the front lines. It is a missile support type mounting a choice or three blocks or six blocks of Anda 115mm Missiles with automatic reload from hull storage and rotation from a modified core hull mounting. There are multiple choices in missiles with high explosive or penetrators being the most common. 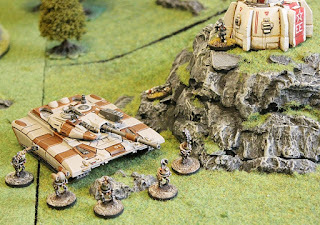 Also gaining in popularity is the Type G which is an energy based weapons platform for Taranis just as the Type C is but where as the Type C has the often problematic super heavy Fretan SBP9 Sequence Particle Beamer the Type G has a turret mounted Valerin 50Mw Laser Cannon which while not as lethal as the Fretan it does not have the manifold and shroud replacement requirements that the SBP9 causes in the fray. 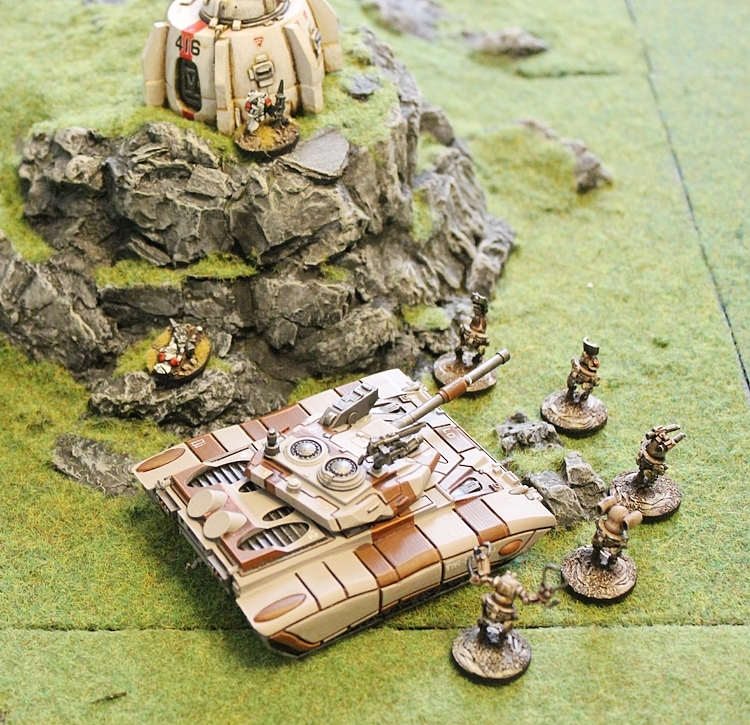 Responding to the increase in ultra large armoured foes on the field of battle the Type H does away with its Turret and has an adapted hull with a centrally mounted 'Eage' 85Mw Valerin Laser Cannon one of the most lethal energy weapons carried by a ground vehicle in the Precinct. Much rarer are the Type I, Type J and Type K Taranis which are in turn a mobile Hurwent Shield Generating station, a quad mounted anti-aircraft vehicle and an armoured battlefield recovery vehicle. Special mention should be made of the rather odd Type L which features a modified hull upon which are four small turrets one in each corner are placed carrying weapons such as the Valerin 15Mw, the Moth 88 Rotary and the Anda 60mm missile pod. Its use is in low intensity warfare as a heavily armoured vehicle which engages primarily light opponents. There are many local specialised variants beyond the official 'Types' recognised by the Targa Works on New Glastonbury in fact too many to even attempt to list however two deserve special mention and have appeared on several worlds. Firstly the designated LSV1 Fueller and Landing vehicle the 'Folm' which is a very heavily modified Model 40 hull sporting a landing pad capable of accepting light and medium classes of flyers such as the Skylark. Its ground speed is restricted but it carries enough fuel inboard to keep a squadron operating in theatre for three days of patrolling and is often used outside of settlements and portable castles where such fuel is a real risk to security. Secondly the designated LSV2 Taranis Type 40 Behemoth or 'Smugen' double hull which is a complex assembly used on worlds such as Myltunkeys II which are desert with vast open flat areas. Custom build from the parts of three Model 40's the Smugen has four sets of tracks and a long central body with a rear tower and turret and many smaller secondary gun mounts and a command deck to the fore. Smugen are slow but very deadly opponents in battle."